Q. What is the DTV Green Dishtenna? A. It is an electronic hybrid satellite dish and terrestrial antenna combined to receive all available free broadcasts within an 80 + mile radius. Q. What frequencies can it pickup? A. FM/ LO-VHF / HI- VHF / UHF/ and SHF for future use. Q. Will it work in my area? A. The Dishtenna will work anywhere around the world that broadcasts digital TV and can receive both horizontal and vertical frequencies from different countries. Q. When was the Dishtenna created? Q. Can you release the specs on the Dishtenna? A. Unfortunately, we chose not to release any technical data at the present time. Q. How many TV's can you connect? Q. I noticed many antenna forums recommend 30' towers and giant Yagis is this necessary? A. It is for the old technology out there. The Dishtenna needs only to be mounted from 3 feet off the ground to 20 feet on the gable end of a two story home. Q. How many channels can I expect to receive with my Dishtenna? A. That will depend on who is broadcasting within 80+ miles from where the Dishtenna is installed. Clients in southern California get up to 126 channels and our Florida clients get up to 80+ channels. Q. What considerations should I give to the antenna cable? A. One should use RG6 dual or tri-shield coaxial cable. Never use RG59. Q. Is Dishtenna affected by atmospheric conditions and weather like satellite dishes? A. No. Terrestrial broadcasts do not go out during heavy storms. Q. Can the Dishtenna be installed in my attic? A. 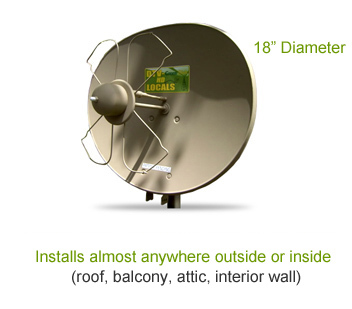 The Dishtenna can be installed almost anywhere including your attic. Q. Can I install it myself, or does it require specialist skills/equipment? A. Yes; however; the use of a signal meter is a must in order to get the most channels. Q. Where can I find out what channels are available at my address? Q. Do I need clear line of sight to the transmitters? A. No: only the general area. You don’t have to see the towers at all. Q. OK, I’m sold! What does it cost and where do I get it?